The engine’s ability to convert energy into mechanical motion relies on precise timing. Once the air and fuel enter the combustion chamber, they must be ignited at exactly the right moment. A vehicle’s ignition system is responsible for sensing the engine’s position and providing a high energy spark at precisely the right instant. The process begins with the crankshaft sensor, a device that senses the speed and position of the crankshaft and sends the resulting information to the Engine Control Unit (ECU). Subsequently, the ECU interprets the signal and directs the ignition coil to send a high voltage to the spark plug, igniting the fuel/air mixture in the combustion chamber. If any of the ignition components are malfunctioning, the spark will not be timed properly, and the engine will not be able to start. If your engine feels like it is running rough, surging, stalling, bucks or if you notice a decrease in fuel economy, you might be experiencing ignition problems. The Car Works! 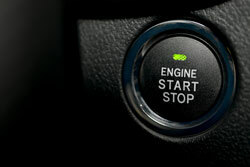 has the state of the art equipment and expert technicians to fix any issues with your ignition. Come by our service and repair center, located in Warren, RI, and we’ll put our years of experience and knowledge to work on your ignition! A vehicle’s engine functions by converting energy from the combustion of fuel and air into mechanical motion. In order for this to occur, the fuel/air mixture must be ignited at exactly the right moment. That’s where the ignition system comes in. During the ignition process, power from the vehicle’s battery is amplified and transferred to the engine via coils. These ignition coils, or induction coils, magnify the battery’s 12 volts to thousands of volts—enough to light the spark plug that then ignites the fuel/air mixture in the combustion chamber. If one or more of the ignition coils fail, it will greatly inhibit the vehicle’s ability to run efficiently. The beginning symptoms of failing coils are poor fuel economy and black or smelly exhaust. If left unfixed, your vehicle might begin to backfire, become hard to start, stall, or fail to start completely. The most common way to diagnose a malfunctioning ignition coil is to monitor the wires that attach to the spark plugs for transfer of power. If the wires are not igniting, then your coils are not successfully converting energy from the battery to the plugs. As soon as you notice any ignition problems, bring your vehicle in. The Car Works! has ASE certified technicians who will make sure that your car is starting smoothly. Simply put, a spark plug takes high voltage electricity on one end and creates a spark at the other end. That spark then ignites the fuel and air mixture inside the combustion chamber, generating the energy that powers the car. A typical spark plug is grayish-brown in color and is made up of an outer shell, a connecting terminal, a core, and several electrodes. On the end that produces a spark, there is a gap between two or more electrodes. When the high voltage is sent from the other end, sparks jump the gap and small pieces of the electrodes are burned off. This occurs hundreds of times a minute while your car is running. Consequently, the gap will widen overtime and your engine will start to misfire. Additional symptoms of spark plug failure include decrease in efficiency, increase in emissions, difficulty starting, and poor vehicle performance. Neglecting to fix a failing spark plug can lead to expensive damage to your vehicle’s catalytic converter. At The Car Works!, we recommend that your car’s spark plugs be replaced between 30,000 and 100,000 miles unless otherwise specified by your owner’s manual. Our expert technicians will ensure that the best spark plug for your vehicle’s engine is installed. The engine’s ability to convert energy into mechanical motion relies on precise timing. Once the air and fuel enter the combustion chamber, they must be ignited at exactly the right moment. A vehicle’s ignition system is responsible for sensing the engine’s position and providing a high energy spark at precisely the right instant. The source of the energy is the vehicle’s battery. During the ignition process, power from the battery is amplified and transferred to the engine via coils. These coils send the resulting high voltage to the spark plug by means of ignition wires. The wires are made with a carbon core which is coated with silicon and insulated with rubber. This allows the wires to conduct the high voltage to the spark plug which then ignites the fuel/air mixture. If the carbon core or the insulation is broken, however, the high voltage will not be sent to the spark plug and a misfire will result. When this occurs, bring your car in as soon as possible. Regardless of issues, The Car Works! recommends checking ignition wires and spark plugs between 30,000 and 100,000 miles unless otherwise specified by your owner’s manual. Don’t risk getting stranded, bring your ignition to The Car Works!—our service and repair center is located in Warren, RI. Our ASE certified technicians will have your vehicle starting smoothly in no time! © Autoshop Solutions, Inc. All Rights Reserved. Click on the TV to learn how your car works. 1st Monday of the month from 9-10 a.m.